A sparkly Green, Silver and Champagne Holiday party invitation -- perfect for contemporary business or personal holiday parties. Assembly Required. Easy to Assemble. Standard A7 size. Contemporary invitation card in a sparkly, crinkly handmade paper wrapper. Kit includes a matching pearlescent champagne invitation card and envelope. Closes with silver paper raffia. Papers are imported from Italy. 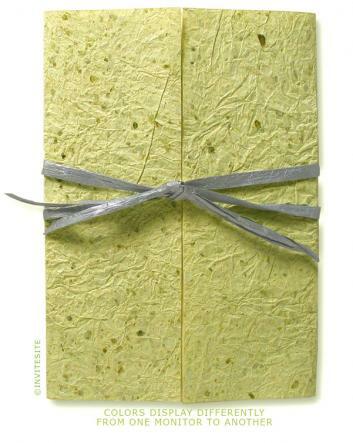 Wrapper is handmade Indian cotton rag paper with lots of shiny mica inclusions. Scored foldmarks and diecut holes for the ribbon. Finished invitation measures 5 x 7 inches. Invite Sheet:Champagne Italian pearlescent cardstock 105 lb. Ribbon:One yard of silver paper raffia. Mailing Envelope:Matching pearlescent champagne A7 size envelope.